[Update:] Be sure to check out my easier, neater way to make onigiri! [Another update:] See all kinds of onigiri on my new bento-only site, Just Bento. [Yet another update:] Before asking a general question about onigiri, please check out the Onigiri FAQ page. Chances are your answer is already there! Have a question about what kind of rice to use? See Looking at different types of rice. Onigiri can stand on their own, or be part of a bento or boxed lunch. (For some reason it's never just called "nigiri", though bento is also called obento, which is the honorific term.) Onigiri are also a great make-ahead snack for a crowd, since with the appropriate fillings they keep rather well. I remember my aunt making 12-cups of rice worth of onigiri at a time for the large family gatherings at New Year's or Obon (August festival to pay respect to our ancestors). Her hands would be bright red from the heat of the rice. She favored salted salmon (shio zake) as the filling usually - very salty salmon in fact. Onigiri is also one of my top comfort foods. It reminds me of the ones my mother used to make for me for school outings (ensoku) as well as countless school lunches. When we stayed at my grandmother's and my cousines and I would take trips to the Chichibu mountain area, my aunt would make huge rice balls to assuage our appetites. There's a comforting feeling of continuity with history too, because Japanese travelers have sustained themselves on those salty rice balls for hundreds of years. Like obento boxed lunches, onigiri can be elaborate creations, but the simple versions the are best in my opinion. We often bring some onigiri with us on long train trips: it's a lot better than buying the overpriced sandwich buns from the vending carts. Yes, sometimes people look at us curiously as we bite into those soccer-ball colored balls. We don't care one bit. While I was working on writing up this entry, I came across this post by Mimi Ito . Japanese people have a lot of emotional attachment to obento, and to onigiri too. Fillings. Some classic fillings are pickled plum (umeboshi), bonito flakes just moistened with soy sauce (okaka), bonito flakes mixed with pickled plum (umekaka), flaked cooked salted salmon (shake or shiozake), cooked salty cod roe (tarako), chopped up pickles (tsukemono), and tsukudani, various tidbits - bonito cubes, tiny clams, etc. - cooked and preserved in a strong soy-sugar-sauce. Some non-traditional fillings that work well are described below. The key to making good onigiri is to have freshly cooked, hot rice. You can't make good onigiri with cold rice. Wet your impeccably clean hands with cold water, and sprinkle them with salt. Take 1/4th of the rice and place on one hand. Make a dent in the middle of the rice with your other hand. Put in about 1 tsp or so worth of filling in the dent. Working rapidly, wrap the rice around the filling, and form into a ball. To make the traditional triangular shape, cup your hand sharply to form each corner, and keep turning it until you are happy with the shape. Practive makes perfect. Wrap the rice ball with 1-2 strips of nori seaweed. Repeat for the rest of the rice. To bring along on picnic, wrap in plastic film or in a bamboo leaf (which is traditional). Some people prefer to carry the nori strips separately, and to wrap them around the onigiri when eating, to preserve the crisp texture of the seaweed. If it's hard to get a hold of the traditional fillings, here are some non-traditional ones that I have tried that work well. However, unlike the more traditional fillings (especially umeboshi) these fillings are quite perishable, so be careful in hot weather if you are taking them for a picnic. Any rather strongly flavored, salty filling should work. Ground meat (pork or beef or a mixture), cooked with grated or chopped ginger, then flavored with soy sauce, some red pepper flakes, sake or mirin, and sugar. It should be quite dry. Curry flavored ground meat mixture works surprisingly well too. Canned tuna, well drained and flaked, flavored with a bit of soy sauce and/or salt to taste. For a fairly well-rounded picnic lunch that can all be eaten without utensils, add hard-boiled eggs (with a twist of salt) or cold barbeque chicken or skewered chicken (yakitori), an apple or orange, and vegetable sticks (carrot sticks, celery sticks, cucumber sticks). Before asking a general question about onigiri, please check out the Onigiri FAQ page. Chances are your answer is already there! Submitted by maki on 2003-12-01 08:31. I've been reading your blog for a few weeks but never ventured into the archives. Then yesterday I had my first omusubi at a restaurant here in NYC called Oms/b. I loved it and I was looking for information on how to make it, when I realized right in my bookmarks was a great resource. And look, an entry on onigiri right here. Thank you. Just to clarify, the rice is just the plain rice from your other recipe, not the sushi rice? You're very welcome and thanks for stopping by my site! That clears it up... I think we have a lot of things backwards from the way they are... as I heard that sake is more about the sake than the food (that you the food is the accompaniment for the drink, rather than vice versa). Oh, my link died. What I meant was that they speak Japanese to me even when I indicate my ignorance! Happened to find your site via TypePad, and became hooked! I have quite an obsession with food myself, and reading your posts (especially those about washoku) make me drool! I have an onigiri recipe linked to my site, but I don't think it's nearly as good as yours in its explanation. It's been quite a while since I've had one, so my memory of its preparation was rather vague. I enjoy reading your blog-- thanks for making it available! Yoko, it's funny because I had an ochazuke recipe in my drafts - and there you have ochazuke on your blog too! I hope you like that recipe too (I published it now). I enjoyed reading your word lists. i was looking for the recipe, and i found it here, ill make 'em tomorrow, my sisters will be very happy, they always wanted to eat Onigiris ^^!! thanks!! Nice recipe! I plan to pick up the ingredients later today, perhaps to make them in time for my party Sunday. Thanks! i'm makeing rice balls for my mothers day apetizer. i have always wanted to make them. also for the rice can use sticky rice? I have had a bit of trouble in my family deciding what to use as fillings, but reading what you said here gave us many new ideas! Oh, and one good filling that you might try is olives. It was in a cookbook I have. Just chop up the olives and mix it in with the rice. Anyway, I've always wanted to make onigiri (I'm facinated with the Japenese culture), but never got around to it. You really helped. I'm 12 and facinated with the japanese culture, too! My friend and I both are. In fact, we're having a sleepover soon and we're gonna make origini and watch anime. Then we're gonna practice our Japanese. We are even going to dress up; me as a Japanese school girl, her as a geisha. I have blonde hair and blue eyes so even if I tried looking like im a school girl from Japan, IT WOULD NEVER WORK!! I wished I were in Japan then stuck in the boring culture, AMERICAN! lol! But, yeah I sometimes get jealous who ever are Japanese because they are pretty! When Im on a mission (Im LDS) I would love to go to Japan!!! :) Its my wish!!! I love anime and fell in love with it since 3rd grade and now im a pro at make anime, realistic anime, manga, chibi, and etc... When your in the Temple University, when you graduate from that college you will be able to visit Japan just with a paper slip from that university saying that your a member of Japan now!!! But, to get in this college you'll have to have tons of A's they will only except people who graduated with only the bests grades! Well, Im going to make some rice balls, PEACE!!!!! Great job, and keep it up! I learned to make rice balls when my husband and I lived in Japan while he was in the Air Force. I always made them with canned tuna. We like them chilled and eat them with hot vegetable soup. Uhmm I'm 12 and I have no pickle plums, I was wondering if I could use something else. I went to Japan this past summer and had my first taste of Onigiri while looking for a snack at Kansai International Airport on my way out of Japan. IT WAS THE BEST PORTABLE SNACK FOOD EVER! Even though it was cold, it was delicious. It was also genius the plastic wrapping job they have you undue that keeps the seaweed apart from the rice ball and it was delicious to eat. I have been looking for the name of that food since I got back to Vancouver (Canada) and I stumbled upon your website with the recipe. Thanks so much for posting this and making it available to everyone! i have all ways wanted to try rice balls but a lot of the fillings don't really please that much but they sound really good. i love the anima fruits basket i hope i can make it like them. Oh! I have always wanted to try onigiri! My Uncle lived in Japan ofr 10 years and told me he loved it! Thank you for the recipe! I can now make it for my birthday party coming up! rena, you may want to try some of the non-traditional fillings listed. The easiest is probably very well drained tuna, seasoned with a little soy sauce. I liked the list of non-traditional ingredients, I first started making Onigiri, when I heard about it in a manga, called Fruits Basket. My firt one was triangluar, but I soon sound it easeir to make them round. I tried with some polish sausage, i do not recommend this. lol. So far, tuna and pickles seems to be the best taste for me, and I normally wrap the nori completely around till the whole onigiri is covers. I have a hard time finding any umeboshi in the us, even online. We have an anime club at school, and I made some and took it to them, I can not tell you how amazed they were at these! Very delicious! I also use Jasmine Rice instead of white rice, it has a different flavor, but doesnt tend to stick as well, so I press harder. lol. Try it out sometime! I have very fond memories of onigiri when I lived in Japan: After blowing six or seven thousand yen ($60 - $70) at the clubs in Roppongi, all you have okane left for in the morning is the train ticket home, a can of hot Morinaga coffee and a couple of 7-11 onigiri. I actually prefer the convenience store onigiri to home-made... sad, huh? Because onigiri is cheap and perishable, the only place you would ever really know about it or find it routinely is in Asia... Korean and Japanese convenience stores have an ever-changing variety of onigiri flavors (and other yummy snacks). Because of its short shelf life you'll never be able to order it over the internet, until some enterprising Japanese manufacturer decides to start exporting it, or making it here in the US. Even then, it's only really good when fresh (off the shelf). The best rule of thumb when making onigiri is that it is a snack of convenience: use what you like and what you have on hand. Vegetarian onigiri is -totally- possible! A filling that is neither very oily nor too wet is best, because rice cannot stick if the filling is too greasy. To ensure a crispy nori wrapping, apply it last, since dry seaweed drinks up all available moisture and becomes soggy, while simultaneously making your rice dry. Wrapping your rice balls in plastic is perfectly fine for transporting or overnight storage, and keeps the rice fairly moist (unwrapped rice dries out very quickly in the refrigerator). Finally, if you would like to try to make a traditional onigiri, you can order umeboshi (pickled plum) or tsubozuke (pickled radish) over the internet. Both make nice, salty fillings for onigiri. To ensure that the onigiri is a convenient snack, you might want to throw an onigiri party, where everyone pitches in to make two or three of their own onigiri using a shared pot of rice, shared nori seaweed and shared fillings/toppings. Yes, I got the idea from Fruits Basket... but I want to make onigiri, so here I am! I don't understand... can you use plain white rice and a filling or what? You may want to read through the Onigiri FAQ, which should answer all your onigiri questions. and yea, i think you could basiclly use anything you want to fill it up with, but make sure you put some nori (seaweed) around it. hey thanks verry much for the recipies. I looked a lot of places but i just couldn't find anyplace that didn't have fish or plumbs for the filling. I'm allergic to fish and my sis can't eat plumbs (can't or won't). Thank you verry much for these wonderful recipies. They are very good. I agree with Misao, your onigiri does look PERFECT. I just read your recipe and it describes it really well. I'm asian (vietnamese) so I have lots of rice in my home. I'm only 12, but I can still take a crack at making my own onigiri. I first found an onigiri in an anime i watched (i'm a HUGE otaku). by the way, that black paper thing on ur onigiri, is that the seaweed or somethin? somebody please clue me in! Ground meat (pork or beef or a mixture), cooked with grated or chopped ginger, then flavored with soy sauce, some red pepper flakes, sake or mirin, and sugar. umm...could you give more detail maybe how much of each and what temp. to cook it at. I think I have found a way to keep them in the fridge (at least for a day, then use them for lunch). Wrap them in waxpaper when they're still warm (do NOT use mayo filling for this type) and put them into sealed zip-lock sammich baggies. It seems to keep them decently fresh and the rice is still semi-gooey/chewy goodness. You have to make them when they're pretty HOT to make this work, apparently the steam/nori-cover/waxpaper makes the nori stick more to the rice and less to the plastic. I'd like to know of some better sauces/bitter or salty fillings (vinegar or non-fishsauce for bitter please, my kid's apparently picky about this but will eat fisheggs. Hmmph.) Or what sort of pickle things to have with them? O_O I love you... Im gonna try this out sometime with chicken. =D!! It says in the recipe "nori" strips, which is dried sea weed.^___^;; you can get it at any big supermarket in the asian section. maya, if you want to stick to traditional Japanese fillings, pickled plum and any kind of pickled vegetables would be great for vegetarian onigiri. You can also try regular (western) pickles finely chopped with the moisture squeezed out a bit - I think the rather stronger flavored non-sweet pickles would do well. Chicken as onigiri filling... well I think you could make tiny chicken pieces sauteed with some soy sauce as filling. excellent job! my shop has been blazing w/ customers. if you ever get any new ones send me some! my shop is a great success now. thanks again!!!!! wonderful recipe, thanks a lot. I LOVE onigiri! My friend from Japan showed me how to make them recently, and they make a great lunch. I found out the hard way that they don't refrigerate well, so making them the day you plan to eat them is crucial -- unless you crave dry rice. Something I like in my onigiri is chopped, homemade kyuuri pickles (lots of salt overnight, then rinse well and soak about an hour in rice vinegar). Chopped takuan is good, also. The photograph (which is why I bought it) shows gorgeous rice triangles (clearly onigiri in terms of shape) with red and green dots, i.e. it looks to me like it's just the rice mixed in with the "Ume Nameshi" and formed. My Japanese isn't good enough any more to even attempt the instructions, but having rushed to your site for hints, this seems to be what I want to be making. Thanks so much for the recipie. I tried it last night because I had people over and my guests were very happy-- but at the end of the night I had 6 left over and I put them on a plate in the fridge. In the morning now [the next day] they taste a bit funny\hard. It may be a common-sense question, but is there a proper way to store onigiri for later use? Do you wrap them in something? Ano... is it ok if I don't use seaweed? it's hard to find any good ones here. the onigiri will still be delicious without seaweed, nee? Thank you, I love making onigiri and I was looking for different filling suggestions (since it's hard to get umeboshi here!) I love your blog! keep it up! Sylvia, I'm not familiar with "Ume Nameshi" itself, but if it's like the packets featured on that page, it's a type of something called furikake. Furikake is basically dried or semi-dried little savory bits - can be nori seaweed, dried umeboshi, bonito flakes, sesame seeds, etc - and it's usually eaten by sprinkling it on to plain white rice and mixing it in. It's usually quite salty, so go easy on it and add more as you taste. You can mix it in well and then form rice balls from the mix too. Michael, the best way to store onigiri is to wrap them in plastic wrap, preferably without the nori on them. You can then briefly heat them up in the microwave if you like. (see this page: www.justhungry.com/2004/01/ochazuke_rice_w.html instead of plain rice - again, heat them up a bit in the microwave beforehand. I was researching what kind of things to put in obento, and I came across your site. I made some onigiri and now I'm hooked! I can't wait to try other fillings! (I didn't have tuna, so I ended up using immitation crab - it turned out well to an unexperienced eater). zomfgg. lyke, thx so much! I just tried these out today...the first onigiri I've ever had, and I made it myself. Couldn't find any nori, but I'm sure it's at the asian store on the corner. Tried one warm after making them, and it was beautiful. Tell you how the cold ones turn out later. Maki, thanks so much for your comment. I do use furikake (mainly seaweed and sesame seeds in what I have) to sprinkle on top of rice, so it gave me an idea what to expect. I made the onigiri without filling (although the triangles eluded me) to get the full flavour of the packet I bought and they were a hit. Thanks again! Hi my names Brieana and I was wondering. I can't seem to find any of the seaweed, but is it possible for me to make onigiri without it. Also is it okay to use pie filling. I once heard peach pie filing is suposed to be good. One last question. Can I use white rice? for anyone looking for a non-traditional filling, try this recipe. it's a tweaked version of a filling for chicken wonton. 12 oz. chopped cooked chicken - 1 tbs. soy sauce - 1 tsp. grated fresh ginger - 1 garlic clove, crushed - 2 tsp. sherry or chicken broth - 1 or 2 spring onions, chopped - 1 tsp. sesame oil - mix all together and enjoy! I couldn't seem to find any onigiri at my local asian stores, so I decided to look for a recipe online and came to yours. Just to say, I tried it for the first time and it's wonderful! I really have to make this stuff often. oh and can we use something different for the seaweed? like a substitute? That sounds delicious kenjikitten. I'll give it a try next time I make onigiri! I decided to experiment with this recipe. I've been recently getting quite into Japanese food (I'm loving miso soup! ), so I figured I should learn to make Onigiri, too -- so that I can put in my packed lunch for going to University (because buying food on campus can be kind of expensive. XD; ) along with a sachet of miso soup paste. Brown rice onigiri can be good, if the rice itself is cooked right. (how to cook brown rice) If you're talking about very glutinous rice (mochi-mai) they might not make the best onigiri...they are a bit too sticky. Though some people do like steamed rice balls made with sticky rice - e.g. the steamed rice in lotus leaves you get at some dim sum places, or chimaki (steamed rice made in wrapped up bamboo leaves) are made from sticky glutinous rice. In the past few years, I've really started enjoying Japanese food. I've been trying to figure out how to make onigiri for a while now and I stumbled upon this. Thank Goodness! I'm having onigiri tonight! How to keep them moist for awhile? I have to make them for a project and im also going to try making them for fun ^__^ Try to expirement haha. You can keep onigiri moist enough by wrapping them well in plastic wrap while still a bit warm, then wrapping again in aluminum foil. They should be fine at lunch time. They'll even last until dinner that way. I'm still mourning the closing of the Toraya tea shop on the Upper East Side in Manhattan. They had amazing, addictive, soy-sauce glazed onigiri. If you've never made onigiri before, I would recommend first trying the plastic wrap method - follow the link, that article has step-by-step photos which should explain things. Actually I've made some with some sweet things for snacks. I found out that cream cheese, is great for it! Specially if you get the different kinds, like the mixed berry. Its a real good late night snack. Also I like rolling the rice in my hands with cinnamon, and sometimes a pinch or two of sugar, depending on what I'm going to put in as a filling. Thanks so much for the onigiri recipe! I made it for a potluck lunch and everyone loved it! They made me promise to make it again at the next lunch! ^^ Mine weren't as perfectly shaped as yours, and my hands were stinging and deep red when I was done with the rice, but it was worth it! Thanks! Btw, I used the tuna filling. It was delicious...but I really wish I had an Asian Market that sold umeboshi. The Japanese market that I usually shopped in had closed down and so I used the tuna. Is there another filling I oculd get at ANY Asian Market? Thanks and please reply soon! I'll be checking back here later! Maybe the easiest filling that is quite traditional is salted and grilled salmon that's flaked. You can buy a regular fresh (raw) salmon filet, that are quite thin, then salt them very well on both sides, and leave in the fridge overnight wrapped in paper towels (not plastic, since you want some moisture to evaporate. Fresh fish will not make your fridge smelly btw.) The next day, when you make your onigiri, grill the salmon and flake to make the filling. Umeboshi and katsuobushi (dried bonito flakes) are available at any Japanese (and most Korean) markets but not necessarily at a generic Asian market. I'm from holland and i understand what the fruit is but pickled? is it dried or like salted to dry it? and what does bonito flakes and cod roe mean? also the pickles you talk about you mean those in jars with sourish water in it right? Wrapping onigiri is not required. See this article about alternate ways with onigiri. Beef jerky? I never thought of it, but if it's flexible and thin enough I guess you could try it - give it a go! I love this website it taught me something new and i appreciate it. ^_^ keep up the good work. I have a question If you microwave an onigiri will it do anything i might nto want it to do..? (such as explode or lose taste etc...) I would really like to know this. you can nuke an onigiri that's not frozen for a couple of minutes, well wrapped in plastic wrap, to warm it up. If you don't wrap it up securely it may dry out and get hard. Domo Arigatoo Gozaimasu. How long should it be in the microwave though..? Im attempting two or three minutes is that a good idea...? For a single, unfrozen onigiri, start with just 30 seconds and see how it goes. Under-nuking is better than over-nuking! It depends on the size of the onigiri, the wattage of your microwave, and so on. This looks like a fun alternative snack or comfort food and I'd really love to have a try at making it but I'm having trouble finding the ingredients, in particular the rice (yes I'm hopeless). Anyone know of a reasonably priced market place or shop for these kind of things in Birmingham UK or somewhere nearby in the midlands? I'd heard onigiri is cheap and convenient but so far all I've had the luck to find was Nori, and that was about £5 for a few sheets. Any help greatly appreciated(heres hoping someone in the UK more knowledgeable than me frequents this site :D). Matthew, take a look atthis page which lists UK Japanese and East Asian groceries. For Birmingham it looks like you need to go to Chinatown - the Korean grocery may be your best bet, but try the Chinese groceries too. Good luck! I love making onigiri with my grandma because Im a really big fan of the Japanese culture, but I was wondering could I put jelly in my onigiri? I just found your website. My kids love onigiri, we fill ours with lightly sweetened scrambled eggs flavored with a touch of soy sauce. i have been looking on how to make onigiri EVERYWHERE! and this makes it super easy! now i can make them for my friends! Another fun/cheap thing to do is to press the rice into small cookie cutters... even my one year old likes them that way! The hot peppers were an idea after a wasabi-tuna mixture was well received. This has proven to be a excellent way to get my friends to start liking rice! a reply would b awesome! There are some suggestions in this article, also check out the all kinds of onigiri article (near the bottom are some suggestions for non-traditional fillings, plus more in the comments). Thanks very much for the recipe! I recently had some health troubles and have been looking into moving to a slightly more Japanese style diet. I just wanted to let people know- if you don't like seafood fillings, you can try a little shredded chicken or pork mixed with a bit of soy sauce or sesame-oil with a bit of salt, and that tastes pretty good. Mixing in some finely diced bean sprouts or bok choy is good too. I've also found that if you want to make small, bite-sized square ones, using an ice-cube tray is handy. Put the rice in the bottom and some filling, then put rice around and heaped above the filling and use your thumbs to pack it down. You can easily make a bunch of small ones at one time this way, and won't burn your hand. If it's sticking, try putting plastic wrap or rub salt water in first. thanks for the tip Sherri! 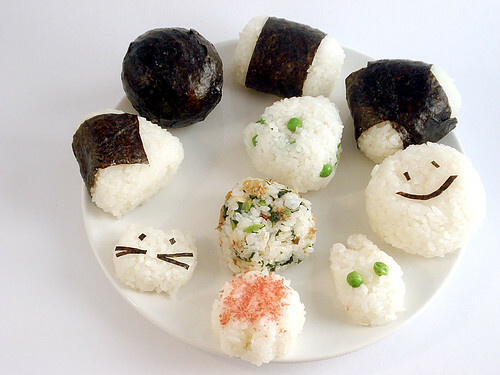 I want to make onigiri for my 4 year old's lunch. Where can I get cute shaped molds? I looked at Ebay, but wasn't sure of the quality (outcome of the onigiri) when I saw some bunny and other little character ones. Is it harder to release the form if it's a design other than the simple shapes of triangle, circle, and cylinder? Most onigiri molds are made for very easy release of the contents. The ones with handles are the easiest to use. Take a look at this article on JustBento (our sister site, in case you hadn't seen it yet) where I make cute animal shaped onigiri. I used a set from J-List, which is a great source for all kinds of bento making supplies (they have several other onigiri shapers besides the Hello Kitty set). Thank you for the swift reply. I appreciate the info on colored rice for onigiri-- so nice that the colors are naturally derived. I'll do some shopping for onigiri molds on Jlist. Thank you for having a healthy, informative, and entertaining website! Hmm, it's funny, I actually had this in Japan, and here in Guam too, but I didn't think of any relation to these rice balls my aunts and grandmas used to make when I was a kid until I saw this post! Perhaps because I've only had them triangle shaped? Anyway, these rice balls I had were slightly different, in that they were bigger than onigiri, but only just big enough to hold in your hand, and the filling in the ones I had always consisted of just this Chinese/Taiwanese, shredded, dried pork. I'm not sure if it's a Chinese food in general, or if it's just a Taiwanese snack influenced by Japanese cuisine, b/c I also remember my aunt making (and I never knew the name of it then, but discovered it to be a Japanese food on another blog recently as well) mochi with kinako! I was actually really happy to discover what kinako was, since I've really missed these foods for a while. im making theese for a cosplayers picnic for all my furuba fan-friends. lawl. just wondering if i can use sweet fillings instead of savoury? ty!! This page has been quite helpful. That being said, I'm something of an anomaly here... I like onigiri, but I haven't been making the "Stuffed" kind. Rather, I like to use some form of furikake and stir it into the rice, sort of a seasoned ball if you will. I've become especially fond of something called Oomuriya Omusubi Tei Umino Megumi, which is a pouch containing four pouches of various flaky stuff for mising into the rice. One sub-pouch flavors and preserves 160 G of rice, enough to make two small onigiri (Which is what they seem to be shooting for). You get one bonito flavored packet, one cod-roe, and two salmon. I guess it has lots of good sea things in it! Can anyone tell me what pickled plums or umeboshi taste like? They are very sour and salty....an acquired taste, though once acquired, rather addictive! Thanks for this recipe!! I've watched a lot of Japanese movies namely Akiro Kurosawa.. and whenever I saw rice balls being eaten, my mouth watered like crazy!! I've experimented with rice trying to make them..but sadly it was no avail... Now I am going to make them ALL THE TIME!!!! I tried making these just two days ago and liked them so much I had to look them up on the net. I've tried smoked salmon and okaka, and I think I'm almost addicted to okaka filling. I've made a batch for my lunch and snacks tomorrow, consisting of okaka, smoked salmon+shoga and tuna/sesame oil/chili paste/soy sauce/wasabi. The tuna mix sounds like bit of a mishmash, but tastes quite fine. Also, I'd like to share a tip with you all. When forming triangular onigiri, i use the fingertips on both hands to try to form a corner, then turn and do it again. Can you believe in Hawaii we put fried spam inside and sometimes scrambled eggs? They are super popular here and are called spam musubi. They are shaped like a rectangle and you can buy molds in the proper shape to form them easily. Not the healthiest, but they are delicious! thank you so much for your detailed explanations on how to make onigiri. I laughed at your reference to Fruits Basket too. I knew abt onigiri long before Furuba and their onigiri motif in Furuba just seemed natural to me lol. I have never tried to make onigiri but now I def want to. my biggest task will be finding the correct rice. Its going to be very hard where I live, we dont have any of the stores ppl mentioned in their comments and everyone here rly just uses long grain parboiled rice. but I will search! I am determined to make and eat and enjoy my own onigiri ^_^ thanks again. We just posted a recipe for Fried Tofu and Miso onigiri (http://www.kitchen-witch.com/2008/11/onigiri-with-fried-tofu-miso-and-gi...) on our blog. We love your recipe too, I'll be linking to it from our post. What a great recipe! I love the peas in the picture - just looking at them is making me hungry! We--the Warlock and I--posted about onigiri recently, too, so I've linked to this, too. I was wondering if it was okay to use Jasmine rice? No it isn't - you may want to take a look at the onigiri FAQ page. is it okay if I dont use japanese rice?because im in philippines,.thanks..^_^..
Why not come over to the Bento forums and post your question there? I'm sure lots of people will have ideas for you. To get you started - if you search around the Justbento & Justhungry sites there are recipes for 'kinpira'. Most of the vegetables that can be made into kinpira can be chopped up into onigiri fillings. "soak 20 shiitake mushrooms overnight, stir fry the drained shiitake for 5 minutes on a high flame and then cook those mushrooms over a very, very low flame with 120mls of the soaking liquid, 2 tablespoons of soy sauce and just under a tablespoon of caster sugar until all the liquid has been absorbed. You can then drizzle over a little sesame oil - optional. They last for a week in the fridge and can be chopped or sliced to make an onigiri filling"
Thanks for the suggestions! That helped a lot, actually. I am not Japanese (to my knowledge) but I take an interest in manga and anime. I found that a lot of people found out about Onigiri through Fruit's Basket, but oddly enough, I found out about it through the comic Naruto (among other foods). Anyway, great explanation! I'll be sure to try it. "Part of their appeal lies in the fact that if you're Japanese, you just love the taste of rice"
Then i must be half japanese (thou i live in Sweden), i have always loved rice! And onigiris are wonderfull, i make them alot. I´m gonna sawe this recipe and make alot of Onigiris, thanks alot for writing it down! whoops can't believe I forgot to say Chinatown NY thanks... again!! There are no Japanese food stores in Chinatown. Umeboshi is generally not found in Chinese grocery stores, though there may be exceptions. Here is a list of stores in the NY area. when i cook long grain rice, it comes out the same stickiness as the short grain rice used for sushi. i dont need to mash up the rice or anything to get it sticky. can I still use it for onigiri? and if I can or cant, whats the difference? I've always wanted to try Onigiri and after i saw this page i got up and made some straight awesome. They're awesome! What's the best type of Onigiri you've ever had?? Though mine had octopus and avacado in them, instead of the traditional stuff; it turned out wonderful, though, and I plan on making more and experimenting with the fillers. Thanks again for the recipe! i never understood onigiri cause i thought it was just rice balls and i never could understand why plain rice balls would be delicious or something to look forward to. but thanks for explaining your free recipes of what goes in an inigiri. Thank you very much for the great sites, I am deffo a regular visitor. could you use spam as a onigiri filling? I live in the crappy state of Indiana and we don't have any down here T_T. They look so good. I looked almost at every dish you've made and they are amazing. ^^ Japanese food is my favorite food. I just found your site and I love it. When I moved away from home (I live in Europe, Finland) my dad got me a rice cooker of all things. So after buying a 5 kilo sack of rice from an oriental food store I did my sushi, more sushi, perfected my technique... and got thoroughly tired of it. Onigiri was my next victim. Now the thing is, I´m over sensitive to most soaps and washing detergents so usually when I play around with rice I don´t bother washing my hands, I just use thin vinyl gloves or a combination of thin cotton gloves and vinyl ones. Hello, I bought toasted seaweed from the store. I am wondering, do I have to get it wet before I wrap the rice ball? Also is toasted seaweed that different from nori seaweed? Thanks! Do you usually eat them just cooled down or chilled? Never, ever ever chilled! Chilled rice is awful. Room temperature is fine, and warm onigiri are delicious. They are filled with homemade salmon flakes. It is hard to find mirin and sake in my country, so i used "Blue Dragon" teriyaki for flakes. Result: very tasty, and my beloved girl is happy! I do have one question- if using the traditional method, does the rice have to be hot-hot or can I wait until it's cooled down a bit? I find using plastic anything with hot food just leaves a plasticky taste. Would waiting until the rice is just the hot side of warm, but comfortable to handle, affect the flavour or stick-togetherness of these? The rice should be as hot as you can stand to handle or it will not stick together properly. Please take a look at the Onigiri FAQ page. This recipe I accidentally came across. I live in isolated reservation(north of canada) so theirs short supply and expensive. Rice is one of the less expensive and lot of it. I can't use the original recipe I have to make alternatives and I used my traditional methods. I only made with the original once. it was good! I firs saw onigiri in some Japanese cartoon in early '90, and I was completelly fascinated by that strange rice triangle. See, I'm italian and we don't have anything similar ("Algae? How can anyone eat ALGAE?!?"). Then years passed by and I started cooking and browsing other people food. I discovered Japanese food at restaurant, but I never find onigiri the way I saw them in those cartoon when I was six. Till I land up your site. I've just finished preparing my first four onigiri and I had a lot of fun cooking them :) Moreover, they look exactly how I dreamt them in my childhood. My compliments for the clarity and the very good description of the recipes. I was away for an exchange programme for a few months and my japanese friends got us all making japanese omusubis. I was completely hooked, they tasted so good and making them was a real joy! My boyfriend and I have been making them ever since I came home (your website was so helpful!) and we always have so much fun with it. I've put together a box and called it the omusubi kit, I'm going to give it him later on! I bought some cute plastic wraps, sachets of furikake, tiny seasoning bottles, rice molds and adorable nori punches. Well, I'm a little confused. I've made rice balls that turn out fine with Jasmine rice. I soak the rice for ages (An hour or two) before cooking it, which seems to only take about 10 minutes rather than 20. The rice still holds it's shape and every thing but make pretty balls/triangles/weird oblong shapes of rice. I've never had any problems with it getting too mushy, am I just magic? Haha. My one issue is when to make the Onigiri. Do you follow through with the entire resting period of the resting of the rice or skip half of it o.O? Also, when I see cup, I think mug. Ten giant sized onigiri later... a video might be really helpful. It is interesting to note that the rice balls still fall apart later after cooking/storing for a while. Not heavily as such but I'm not sure how much compression is needed. I used Tuna Mayonnaise for my fillings and I might make some Yaki next time. Is there a follow up recipe for Daifuku or is it fuki..o.O it's a rice ball sweet. [quI think I have This type of rice because every time I cook with it it always stick together . I'm young so I'm still learning to cook. Actually, I tried making these today, and as I didn't have any pickles, tuna, or any of the meats she suggested, I ended up just sauteing some mushrooms and mixing them with sauces I had in the fridge. Curry is a type of sauce and will probably make your onigiri runny. If you want curry flavor, try using curry spice, some cardimom, ginger, etc. Or, curry paste mixed with whatever your filling is works very nicely. I used green curry paste with mine. You do want to be sure to season your fillers if they're bland, because curry doesn't usually add much salt -- mostly spice. I actually made my mushrooms a little too salty on their own, which balanced out the rice. I also used a spicy garlic chili sauce (the kind with the rooster on it, sorry for the vagueness), which had enough flavor that it didn't really need extra seasoning beyond basic salt/pepper on the mushrooms. I liked my rice balls with just these things (maybe a dash of sesame seeds), but on the balls that I got the proportions (filling to rice) wrong with, I just added a dab or two of soy sauce. Not the most authentic, but plenty yummy. I believe I did something wrong because when I made the rice it came out gross and too bland(Yes, I have had this rice before). Do you know what I could have done wrong or could do to fix that? I don't know how I am supposed to know how it went wrong without seeing or tasting it, but 'bland' indicates a lack of salt. Onigiri rice balls saved the day! 1) i ran out of food sooner than expected, and had to either starve for two days or come up with something to eat that wasn't fast food or ramen noodles. 2) being alone in the house for so long led to loneliness, and then to massive depression as i kept worrying about my future and the recession. i decided the best way to pull myself out of it was to challenge myself with something new in the kitchen. anyway, thanks for making this blog and sharing these great recipes. thank you!! that really helps, i've always been a japan lover and wanted to make japanese food but the problem is that in the town where I live I can't find this japanese rice type and I'm a little disapointed so can I use the normal rice with medium size?? I tried to cook it with the japanese way and it was sticky and taste good, so I wonder if I can make Onigiri and other japanese dishes with??? Well here we go. This morning was my first time making onigiri (my hand's still pretty warm) and I say I'd love to do this again. However I've encountered some problems. I don't know if I did something wrong or any. Anyway, I cooked the rice the way you said it's supposed to be, I think it was on another post. Well I only used 1 cup of rice since I'm the only one who's going to eat and I don't eat much to be honest. I have a rice cooker so I did it there. Anyway when it was finished the bottom bit was brown/toasted so I left that and used the well done parts. I made the rice balls traditional style since I forgot the plastic wrap. I made it right after the rice was cooked, so I was surprised to see that after my first rice ball the rice in the cooker is drying out really fast (or hardening lol I hope you get what I mean). Still I went on and managed to make 3 good sized onigiri, I made a fourth one but I ended up eating it xD, it tasted good so I was really glad. Anyway, what's up with the rice? I bought "sushi rice" from tesco - that's the label, is that different from the japanese rice you're mentioning? Cause that's the only japanese rice I could find here in town. Also, when putting the filling and trying to cover it with the rest of the rice, I failed pretty bad. I pushed it in lightly without disintegrating the rice but I can't cover it so what I did was get a few bits more of rice from the cooker,put it on top and molded it into a ball. I used plain tuna by the way, it was already drained so it wasn't oily at all. Didn't put mayo because I hate mayo. I say thoroughly drain the tuna using paper towels. If you don't like mayo, Dijon mustard also works wonders. You can also microwave rice so it doesn't burn. You just need a container that has a lid but not tight to prevent the lid from busting when the rice boils. If the ball still disintegrates, just cover the whole thing with nori to hold it all in. Hope that helps, though the plastic wrap will help immensely. I find that medium grain rice works/tastes best. They also have onigiri molds on amazon (in different cute shapes too) that you can use to mold the rice, since medium/short grain rice is VERY STICKY. We're a gaggle of volunteers and opening a new scheme in our community. Your site provided us with helpful information to work on. You have done a formidable process and our whole group shall be grateful to you. I found some umeboshi, so I tried making onigiri for the first time with a friend the other day. Both of us were amazed at how good they were! We are both vegetarian, but with allergies that usually make it impossible to eat the same food, so it's great finding something both of us can enjoy. I admit I learned a lot about onigiri from watching and reading Fruits Basket. I had some onigiri once a long time before that, but it was a flavoured rice variety, with no filling. I have been on all your different pages so many times and they are all so helpful. I made my first onigiri tonight and used your "cheat" with a plastic bag. it worked perfectly. all my rice balls stayed together (on the first try) and my daughter is so excited to take them to school tomorrow. thank you so much for all you detailed instructions and helpful hints. I first discovered onigiri when a Japanese friends shared them with me during a canoe trip. Love at first bite. I have made them occasionally since then, my kid loves them too. I just came back from a business trip to Japan and have renewed interest in Japanese cooking. While watching Japanese television, I found that they do indeed use all kinds of unusual fillings for onigiri (and sushi rolls, for that matter). Fell in love with umeboshi at breakfast on my first day. Thanks to your blog, I learnt I can use them as a filling for onigiri. I will be preparing a Japanese meal for friends soon, thanks for your many great entries! I have never made onigiri but wanted to know if you could make them in advance and how long they would keep in the fridge? I bought some seaweed shavings mixed with sesame seeds in a Korean market and was wondering if they have any place in onigiri? Thank you and I just love your topics. You are great! Take a look at the Onigiri safety and transport section of the Onigiri FAQ page which should answer all of your onigiri-making-ahead/safety questions. I really don't know what those seaweed shavings are so I can't say for sure if they are good for onigiri or not. You'd have to try it out and see! I was wondering, can you put jelly in the rice balls? I'm a college student and very tired of eating out of the snack machines plus, I really don't have time in the mornings to eat breakfast and by the time I get home its either close to noon or well passed. I stay away from school prepared food but I'm also tired of just junk food, is there any other flavors I could put into the rice balls? Hey, just a quick question. I know it's not traditional, but would caviar work as a filling? It's pretty frickin' salty LOL. Just made my first batch of onigiri for me and my Japanese roommate! AWESOME!! She can't cook, but has always loved traditional Japanese food. Being a woman up for a challenge (also not in the least Asian) I turned to this blog and JustBento to learn all I could about this style of cooking. Totally great information! I figured onigiri was a good place to start because its such a staple. I made pretty big ones with the real Japanese medium grain rice (I used your frying pan method, totally works) and filled them with bonito flakes and a sort-of barbeque sauce I thought looked good at the asian grocery store. Delicious! Served with tamagoyaki and steamed veggies, I'd say it was a successful first bento! Didn't take long either. We made the rice balls together last night after dinner, wrapped them and stashed them in the fridge. Then I made the 1 egg tamagoyaki recipe this morning while the veggies did their thing in the microwave. Done in ten minutes.